Remodel your home kitchen and turn dreams into reality easily and affordably. Gift your home, your families and yourself, a well-designed and equipped kitchen with everything you need. To have your dream kitchen come true, you need renovation experts who are ace at home improvements and rule the custom cabinet design industries. Choose CozyHome if you are looking for kitchen renovation contractors in Kitchener who can provide you with top quality products and services at economical prices. CozyHome’s custom kitchen designs are one of Kitchener’s top kitchen renovators renowned for making creating tailored kitchen cabinets for clients in Kitchener. Our incredibly talented and experienced designers assist our clients through the initial phase of planning and designing their kitchen as per their choice. Our goal is to ensure we prioritize our clients’ preference and give them the kitchen they truly want. CozyHome is your expert guide through each step of this remodelling process. We specialize in custom cabinet designs and high-quality carpentry including the design and manufacturing of cabinet. In short, we master full kitchen renovations in Kitchener. At CozyHome, we make sure to prioritize your kitchen cabinet needs and completely take care of your kitchen remodelling project. All you have to do is relax and wait to enjoy your new kitchen. CozyHome works hard and smart to give you the gift of a happy kitchen. Take tentative measurements of your kitchen space to CozyHome designers on your first meet, for instance, window sizes if any, ceiling height, wall to wall measurements and so on. Take a thorough look into their kitchen cabinet designs and pick references. The CozyHome designer will help you with a 3D design of a custom cabinet design as per your liking. You will also be given a price quotation for the advised kitchen design. Any further alterations will be FREE of charge. CozyHome will have its in-house professional technician contact you to book an appointment to come by and take accurate measurements of your home kitchen. The technician will come over to your place to thoroughly measure and map your kitchen space in order to make suitable recommendations. This is a crucial step in the process as the custom design cabinets for your Kitchener home will be manufactured according to these specific measurements. After all the measuring and mapping, the technician will get a confirmation from you on the design and fix an installation delivery date. On the day of your installation, our installation experts will deliver your newly remodelled kitchen parts and designer cabinets. The process of installation generally takes about one to two days depending on the size of your home kitchen. After your kitchen installation, one of our technicians will fix an appointment and visit your home to take countertop measurements, which is required to customize as per the specifications of your kitchen, and this process typically takes one to two weeks of time. This step is the best because your beautifully remodelled kitchen is all set up with designer kitchen cabinets. Enjoy your newly renovated kitchen! We advise our customers to cautiously follow our maintenance guide to make sure that your cabinets last a long time in good condition. CozyHome has a diverse range of designer kitchen cabinets and vanities to choose from. Our range of CozyHome custom kitchen cabinets in Kitchener includes Antique White, Espresso, Walnut Glaze Step Charcoal Gray, Step Shaker White, and Off White. It doesn’t matter what kind of taste you have when it comes to kitchen furnishings. Generally, kitchen renovation takes either a traditional route or an unconventional, modern one. Some homeowners also prefer a blend of the two. 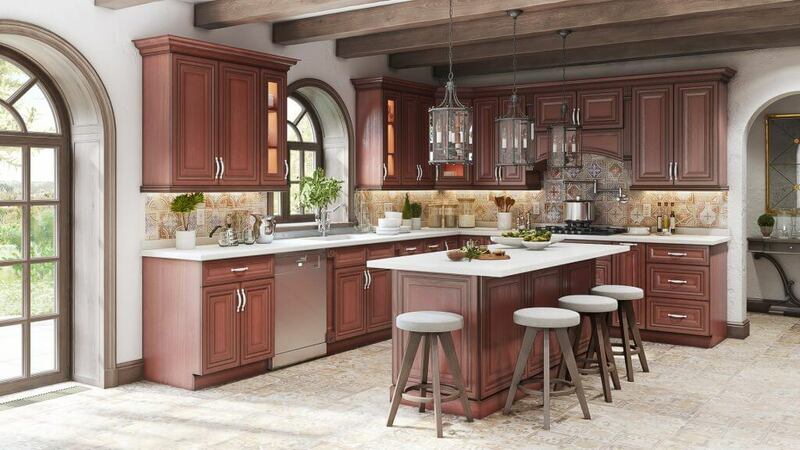 Traditional Kitchen designs are the ones that follow the basic with wooden cabinetry and warm colours. Modern Kitchen style has a trendy look with a more avant-garde look. Contact us for more information about our services in Kitchener.